As a child, lamb was never my favourite meat. I actually would say it was my least favourite meat. At home we had it BBQ or roasted mostly. My family liked there lamb cooked right through, which is fine for them, but I have discovered it is why I never liked it, I like my lamb to be pink. It was only after I started cooking lamb myself that I discovered I actually love it, just cooked less. So here I have given cooking instructions for lamb that is nicely pink, if you like it cooked more just add more to the cooking time. This dish is really, really nice. 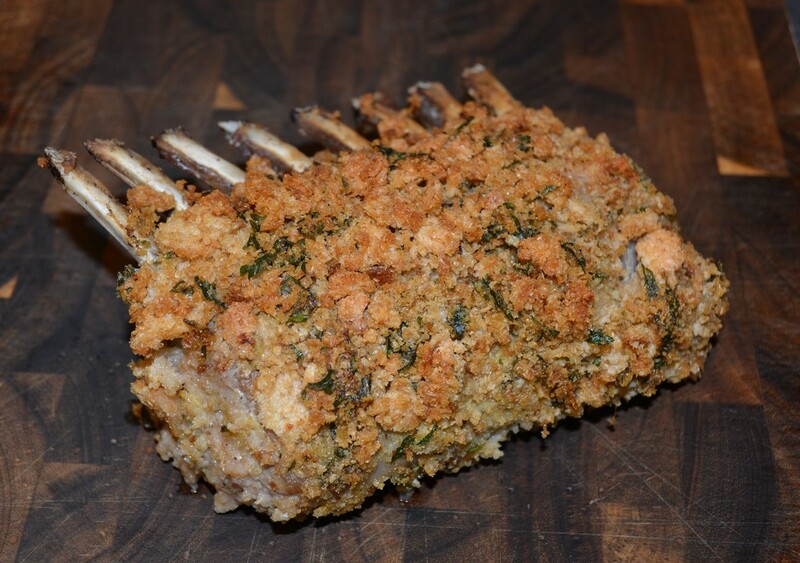 My family loved it, we all loved the crumbs, and the lamb was so soft and moist, it was beautiful. This is definitely something I would cook again, as watching my family eat this brought a smile to my face. When I cook and the food is loved by my family, I do get quite excited. And this is how I cook my meals. With food, rather than cooking something just to feed them, if I'm going to cook, I want it to be an experience to eat. So when I choose what I'm going to cook, it is always with the intention of giving my family something they will remember. Sounds corny I know, but with all the effort that goes into cooking, I want it to be great, and I want my food to be loved. So when it is loved, it is a great feeling for me. Place the bread on an oven tray and bake for 20 minutes or until lightly golden. Allow to cool. Place in a food processor and blitz to coarse breadcrumbs. (You don't want it too fine, you want different sized chunks in it, but not big chunks either). In a bowl mix together the breadcrumbs with the parsley, lemon zest, garlic, olive oil, salt and pepper, mix well to combine. Rub the extra olive oil over the lamb racks, season well with salt and pepper. Heat a large frying pan over high heat for 2 minutes. Add the lamb racks to the frying pan fat-side down. Fry for 3 minutes. Remove from the frying pan and place in a roasting dish fat-side up. 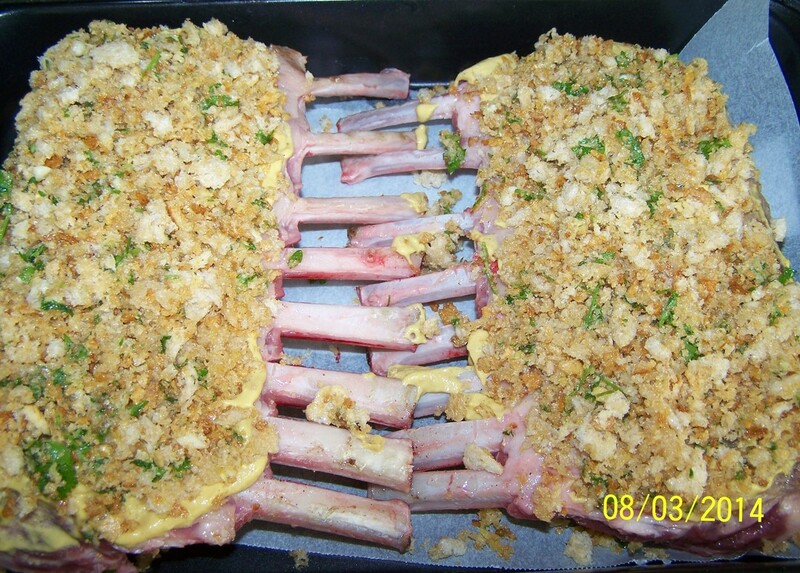 Spread the top of the lamb racks with the mustard, then press on the prepared breadcrumb mixture. ​Place in the oven and bake for 30 minutes for lamb that is nicely pink. If you prefer your lamb cooked more, bake it longer. Place the cherry tomatoes on a baking tray, season with salt and pepper, drizzle over some olive oil. Remove the lamb from the oven and loosely cover it with foil, allow to rest for 10 minutes (5 minutes if you cooked the lamb longer). 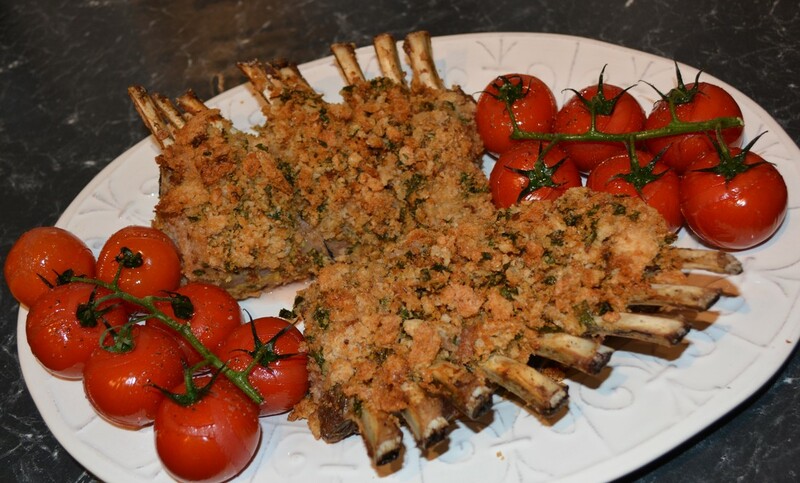 While the lamb is resting, place the tomatoes into the oven and bake for 10 minutes, until the skin just splits and the tomatoes are warm. To serve 4, cut each rack in half, to serve 5, cut each serving to allow 3 racks each, with one person getting a 4th rack (it was my 7 year old that got the 4th rack this time). 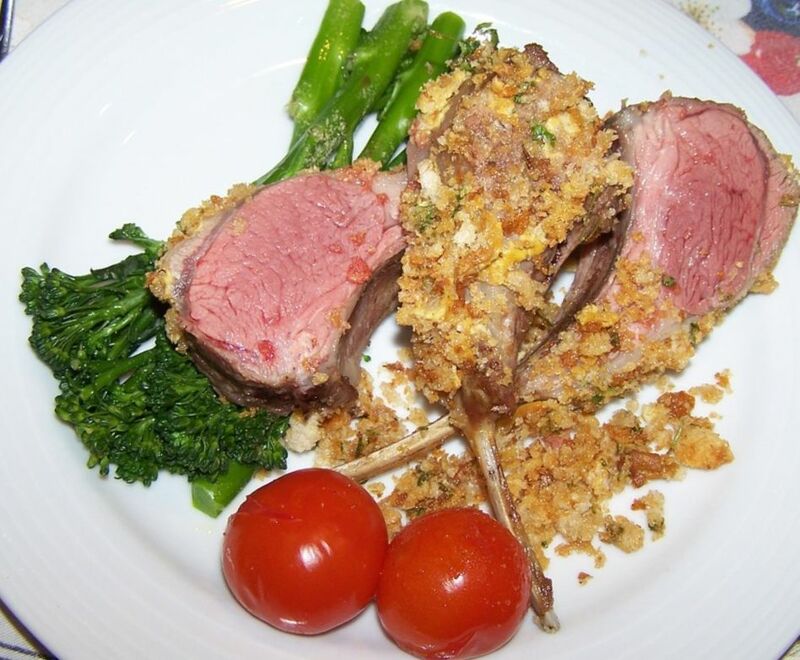 Serve with the roast tomatoes, and steamed broccolini is lovely with it also.